Grinders, right angle grinders, wheel grinders, type 27 grinders, air grinders, pneumatic grinders, angle die grinders, and angle grinders. Most of these grinders have a 5/8"-11 threaded spindles. A few have a 3/8"-24 threaded spindle. See the spindle column across from each item number. Additional grinders are shown on our Grinders with collets page. SAFETY WARNING: Make sure the RPM of the grinder you choose below, does not exceed (is less than) the maximum RPM of any accessories you use with that tool. WARNING: Proposition 65 Label for all St. Louis Pneumatic grinders shown below. Great utility tools for weld preparation, rust removal and deburring. 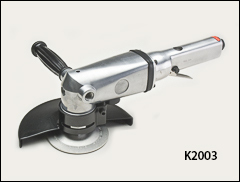 Lower prices are available for the K2001 and the K2002 for 10 and 25 tool orders. St. Louis tools: 3/8"-24 or 5/8"-11 spindle, 12 CFM, 90 PSI, 1/4" air inlet, 3/8" min. hose, 9" long, 3.70 lbs. Sioux tools: 5/8"-11 spindle, 3.3 CFM, 90 PSI, 1/4" air inlet, 3/8" min. hose, 10" long, 3.90 lbs. Sioux Signature Series non-governed grinders with a lockoff lever throttle and rear exhaust. 4 1/2" wheel capacity. Includes support handle and a wheel guard. Two spindle sizes. 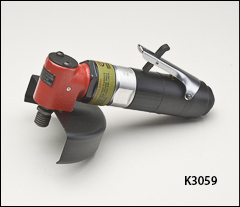 3/8"-24 or 5/8"-11 spindle, 35 CFM @ 90 PSI, 1/4" air inlet, 3/8" hose, 8.3" long, 3 lbs. 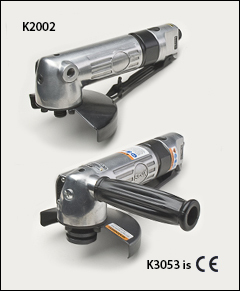 St. Louis Pneumatic grinder, a true workhorse operating at 7,500 RPM with an air motor rated at 1.25 HP. Drives 7" type 27 wheels with ease. Includes a wrench. 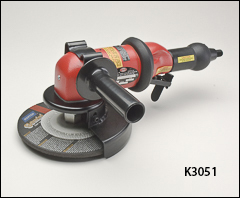 Lower prices are available for 10 and 25 tool orders of this grinder. 5/8"-11 spindle, 12 CFM, 90 PSI, 3/8" air inlet, 3/8" min hose, 16" long, 8.4 lbs. Sioux Industrial governed tools perform better under heavy loads when they tend to slow down. They allow more air to enter into the motor to try to keep it at the rated speed. Lockoff lever throttle, side exhaust, and a wheel guard 85 dB(A). 5/8"-11 spindle, 35 CFM @ 90 PSI, 1/4" air inlet, 3/8" hose, 12" long, 7 lbs.